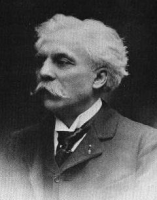 French composer Gabriel Fauré (1845-1924). He was the foremost French composer of his generation, and his musical style influenced many 20th century composers. His harmonic and melodic language affected how harmony was later taught. Pagliara, Rocco Emanuele Panzacchi, Enrico Parry, C. H. H.